What better words to sum up the lure of the West coast of Ireland, where the roar of the Atlantic beckons. As a child my grand-father, who was, to all intents and purposes, my father for the first eleven years of my life, took me fishing, first from the pier at Saltburn on the north east coast and later, from the shores of Redcar, in a small fishing boat. His sea stories infused my childhood. Climbing took me to the cliffs of Pembrokeshire, abseiling into wave washed zawns where the incoming tide could add exhilaration and urgency to the adventure. Sailing took me to the Greek Islands, where on gusty days, the yacht would heel over, bringing the sea up towards you as we crashed through the waves, the sheets sharply slapping the stays, spray flying, flavouring the wild air. 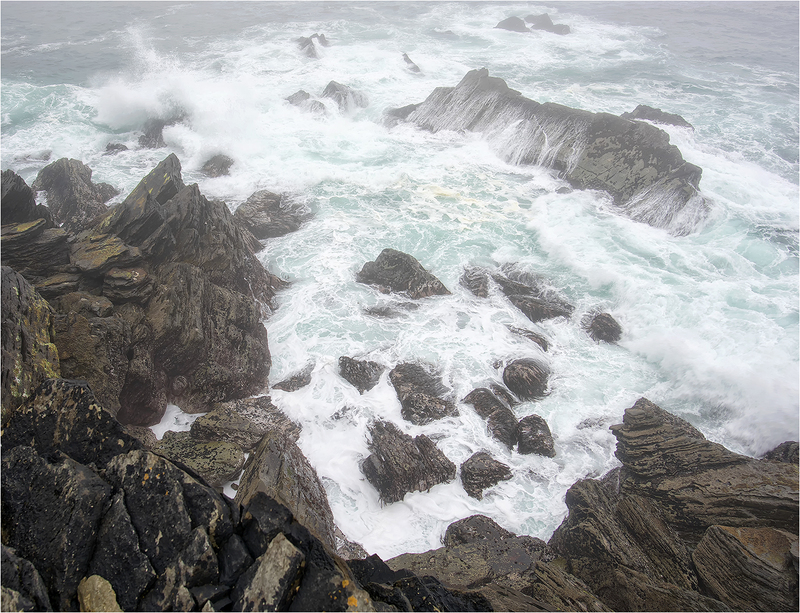 Ireland touched and reignited those memories as we explored the west coast. How could I resist the call to make new images. The power of photography often rests in its ability to ‘catch a moment’. Timing is all, as I waited for the waves to crash beneath me. Click. Missed. Try again. Click. Missed. Pay more attention to what is happening. Get a sense of when the waves are coming in and pouring over the rocks. Click. Got it. Back at the hostel, the composition needs refining as I examine the computer screen. Cropping strengthens it and I work to bring out more of the detail and capture the drama I recall in my memory. 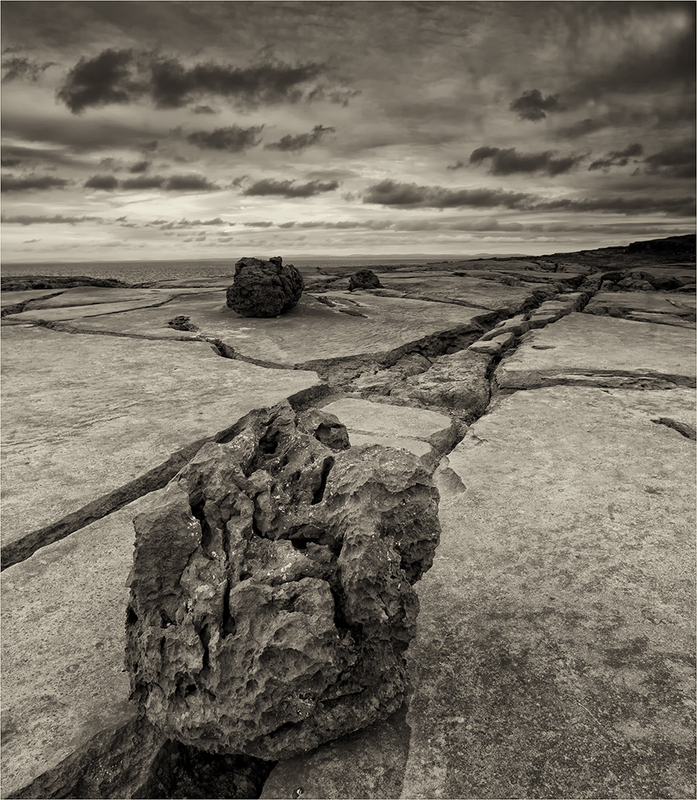 The Burren, in the northern reaches of County Clare, is an alien limestone landscape: a moon-like mosaic, divided by clints and grykes, extending for miles. Hidden within this maze are Neolithic monuments which we sought. Sadly, we struggled to match our local made map with the signs at the side of the road and the ground before us, frustrating our efforts. Occasional successes earned some relief, but left us with nagging doubts about hidden treasures. So we turned from our prehistoric hunt and back to the majesty of the limestone, the ‘pavements’ stretching into the mountains, ringed by the Atlantic. The clints and grykes offer strong compositional elements, punctuated by ‘eratics’, boulders abandoned by glacial actions millennia before. Soft light brought out the details, emphasising texture. Overcast clouds added mood and drama, especially when they are turned to monochrome, stressing the surreal and belying the belief of many that strong light is best for photography. The battle for composition begins, aided as always by a tripod and spirit level. Finer and finer adjustments are made until at last I capture an image which pleases me and hints at the majesty of this special place. Your beautiful and heartfelt words echo the exquisite images with which you so generously share with us. For each and everyone of us who loses themselves within photography, or for those who just delight in in such images, could not help but realise within themselves the transportation to your captured destinations. Fabulous, engaging, and now running for my camera gear. Thank you Roy.